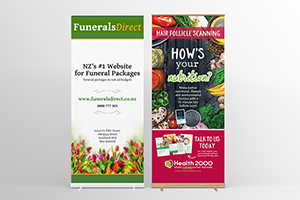 Pull-up Banners | Fusion Print - Waikato's leading sustainable printer. 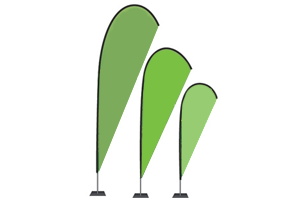 Banners and flags are a great way to get your message out at events, market stalls, trade shows or out in front of a retail location. No matter what you are promoting, vinyl banners are a high impact way to market and promote. We can provide you with templates to follow if you wish to create you own or out talented design team can work with you to create something from scratch. 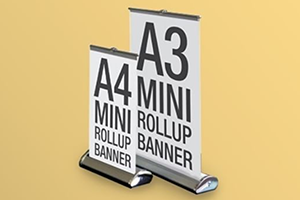 Below is a list of common banner types. It is important to consider which one would best suit your needs - of course if you are unsure, we can help with that too! A robust and professional freestanding retractable display. Easy to assemble and comes with a fabric carry case. Banner skins are replaceable and can be made of all forms of banner media or textile. The bamboo unit is made from 90% renewable resources. A miniature version of the full sized banner. Perfect for desktop, table or POS display. Like, the full size option, the skins on these banner systems are replaceable and they are simple to assemble and come with a fabric carry case. 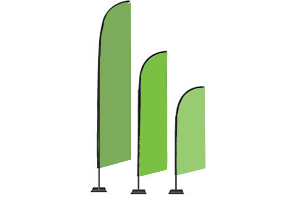 With a distinctive upper curve and straight leading edge, Teardrop flags are high impact display tools. Available as either single or double sided flags with a wide range of mounting options including: Cross feet, water base, ground spikes, wall mounts and tow bar mounts. Standing tall, straight and wide, WindBlades have a large print area and are guaranteed to drawn attention. Available as either single or double sided flags with a wide range of mounting options including: Cross feet, water base, ground spikes, wall mounts and tow bar mounts. We can create one-off uniquely sized and finished display banners from a range of banner stocks and textiles. These are perfect for table cloths, marquee dressing or as a back drop to stalls. We can finish your banner with eyelets, velcro or hooks for installation.